Here are a couple of holiday layouts. The first, is obviously, of my favorite boy. The second is of Debbie Mayberry's three grandchildren. I went over to her house Saturday to shoot holiday pictures. This is one of my favorite pictures of the three little ones. It was totally unscripted, but the baby (Lance) was content to lay on the floor below the Christmas tree, and I talked TJ and Chloe into joining him. They look so happy in this picture (and ornery). 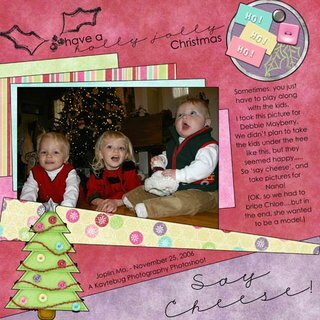 Both layouts use sketch challenge templates from The DigiChick.com. The thanksgiving layout uses Heather Roselli's Fall Smell Kit, while the Christmas Layout uses the Holly Jolly Kit, both found at DigiChick.com. I'm going to start posting pages here, as I get them designed. This will help "motivate" me to make more digi-layouts--if I can share them with others.